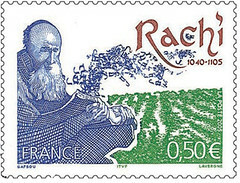 Rashi was the greatest commentator on the Bible and Talmud; born in Troyes, France in 1040, and died there in 1105. By combining the Hebrew initials of his full name, Rabbi Shlomo ben Isaac becomes "Rashi". As a very young boy he gave evidence of his fine and retentive mind and everyone marveled at the extend of his learning. He left Troyes at an early age to study at Worms, Germany, the second of the so called »ShUM« towns with a significant Jewish population: Speyer (yidd. Shapira), Worms and Mainz. There he married, though he was poor and still a very young student. Later, Rashi was elected Rabbi of Troyes and he worked without pay. He founded a Yeshiva (Talmud- Tora school) which became famous and had many students. Rashi was the author of treatises on many subjects; but his fame is based on his brilliant commentaries on much of the Bible and the Talmud, which scholars consider an indispensible guide to the understanding of both these books. It has been translated into Latin, English and German and is used by scholars throughout the world and also by those who seek a first introduction into Talmudic learning. Besides these skills he was a vinedresser. Both his capabilities are displayed on a French stamp shown here. Many legends are woven around the great Rashi — but he was hardly the miracle- man of legend. The true miracle of his life was the devotion, the brilliance and long labour he exhibited in expounding the meaning, language and religious values of the Hebrew Bible and Talmud. 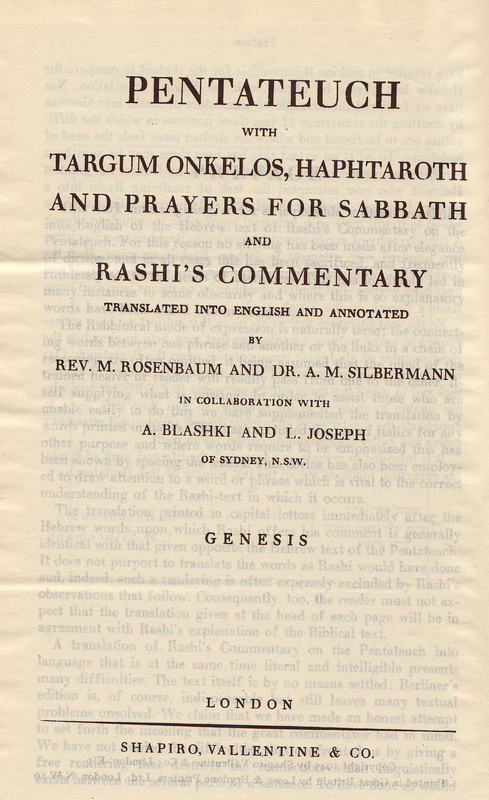 Pentateuch with Targum Onkelos, Haphtaroth and Prayers for Sabbath and Rashi‘s Commentary. Translated into English and Annotated by Rev. 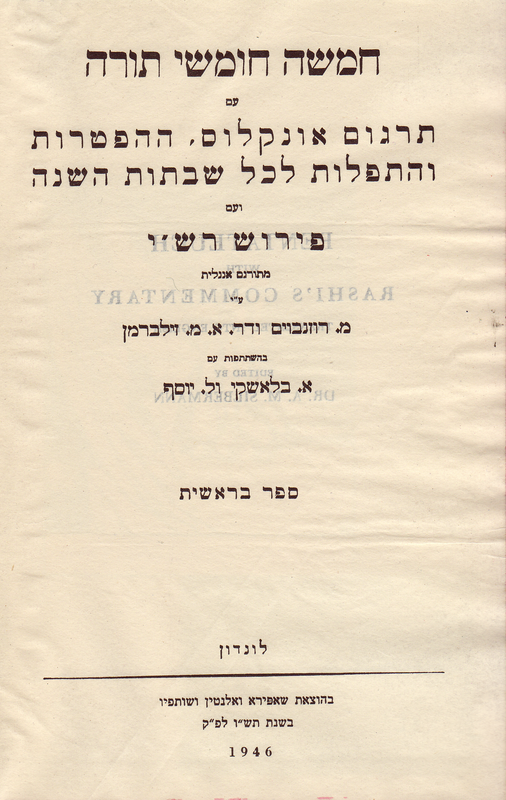 M. Rosenbaum and Dr. A. M. Silbermann in collaboration with A[aron] Blashki and L[ouis] Joseph of Sydney, N.S.W. Publisher: London, England (U.K.): Shapiro, Vallentine & Co. Contents: Genesis, Exodus, Leviticus, Numbers & Deuteronomy, with Targum Onkelos, Haphtaroth and Prayers for Sabbath and Rashi‘s Commentary. Comments: Available in 2 or 5 Volumes. Two- Volume Edition discussed here: Vol. 1 with Genesis and Exodus: Octavo: (8), 255 double, 27 & 32 pp (Genesis); (6), 226 double, 49, 38 & 68 pp (Exodus). Vol. 2 with Leviticus to Deuteronomy: (6), 135 double, 75 & 32 pp. (Levit. ); (6), 174 double, 39 & 22 pp (Numbers); (6), 179 double, 63, 28 & 64 pp (Deuteronomy). Targum Onkelos, Haphtaroth and Prayers in Hebrew only. 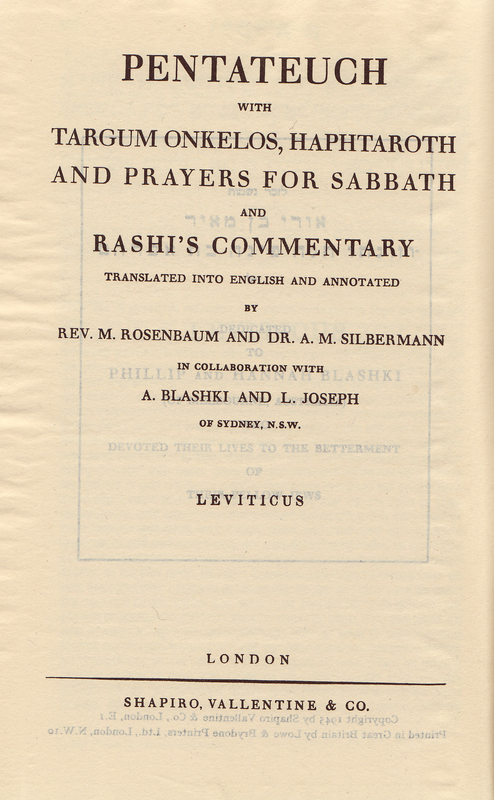 The Hebrew terms within Rashi´s commentary are translated; some of Rashi´s annotations are explained in an appendix. 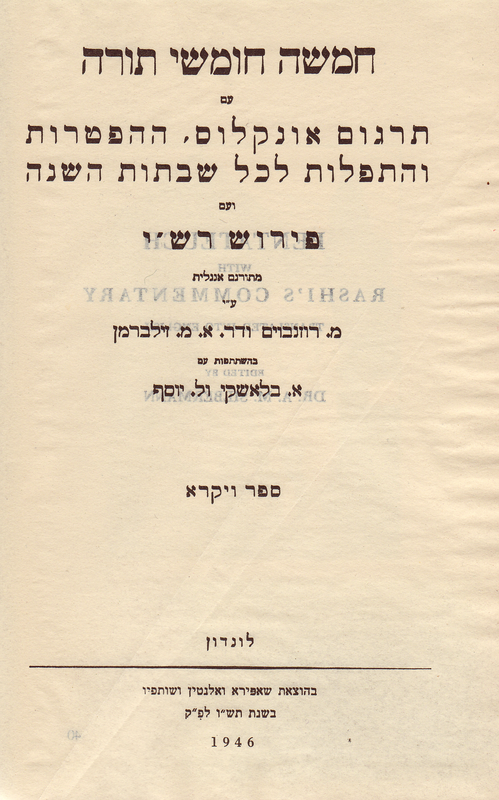 The Australian scholar Aaron Blashki spearheaded Rashi´s Translation; therefore this Torah Edition is called »The Blashki Chumash« in Australia, elsewhere it is known as The Silbermann Rashi. It was first published in Australia between 1929 and ´34. Only recently (2012) the first (of 5) Volumes by [Rosenbaum &] Silbermann has been translated into German with the Genesis- translation adopted from S. R. Hirsch.